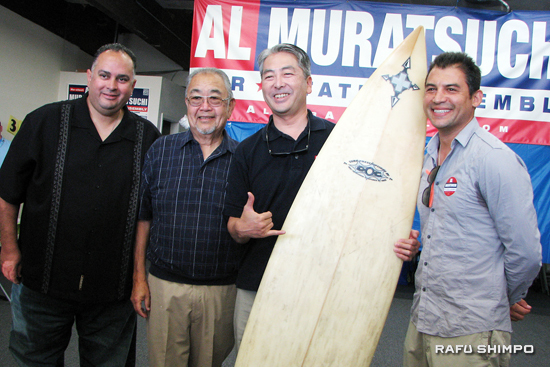 Current and former Asian American/Pacific Islander elected officials from around the state showed their support for Assemblymember Al Muratsuchi (D-Torrance) at his campaign headquarters on Sunday as volunteers prepared for an afternoon of precinct walking. 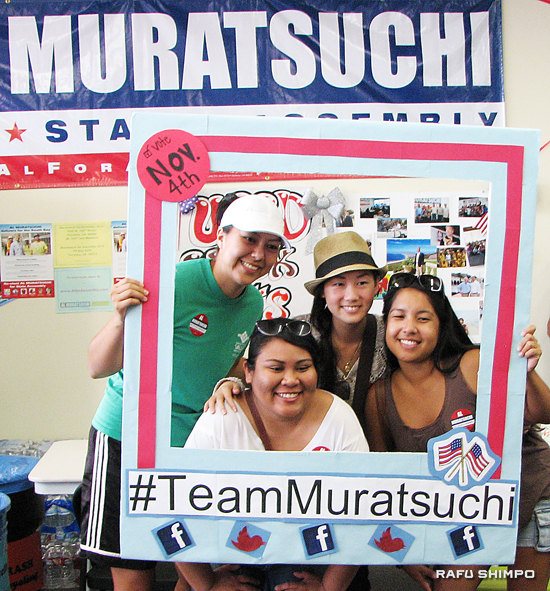 Muratsuchi, who represents the 66th Assembly District, is running for a second term in the Nov. 4 election. His Republican challenger is small businessman David Hadley. 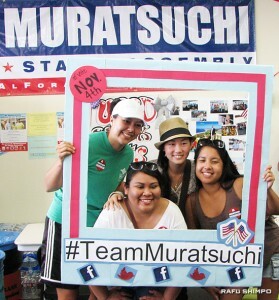 Young members of Team Muratsuchi at campaign headquarters. Upper left: Elena Santamaria; upper right: Yong Eo; lower right: Samantha Seng; lower left: Lianna Mecano. Assemblymember John Perez (D-Los Angeles), former speaker of the Assembly, commented, “It is not only one of the most important races in the state; to me, it is one of the more personally important … It’s about getting somebody to come back to Sacramento who’s led in a way that is purposeful, who has figured out a way to be an absolute champion for education, a great steward of our environment, a great protector of our public safety. Alluding to a Hadley mailer that says Muratsuchi’s legislation “would expose our kids to sexual predator teachers,” Perez said, “As a career prosecutor, as a school board member, there was nothing more important than both the education that our kids received and the safety of our kids … He put together a bipartisan approach to be able to get rid of child predators and people who are a threat to our kids in school, and streamline the process by which we can get rid of the bad actors. State Controller John Chiang, a Democrat running for state treasurer, recalled California’s recent financial crisis, which necessitated a 32 percent increase in tuition at UC campuses. He told the young people in the audience, “You have the highest unemployment in the history of the United States of America since the Great Depression when we talk about teenage students last year at 34 percent; college students, highest unemployment since the Great Depression; recent college graduates, not at Depression levels but still pretty high. Assembly candidate Evan Low (left) and State Controller John Chiang. Evan Low, a city councilmember and former mayor of Campbell (Santa Clara County) and the Democratic candidate in the 28th Assembly District, took time out from his own campaign to attend. “Al’s race is very important. That’s why we’re here to make sure that all throughout the state we can support Al,” he said. Muratsuchi said in an interview, “Our polling looks good, but it all comes down to the turnout. No one can predict who’s actually going to vote on Nov 4, so that’s why each and every vote is so important … Gov. Brown is looking so strong in the governor’s race that we’re concerned that people are just going to stay home. But there’s so much that’s important on this ballot, not just who their state assemblymember is going to be, but also we have elections … for Congress, an election for our new state senator … our other constitutional officers. 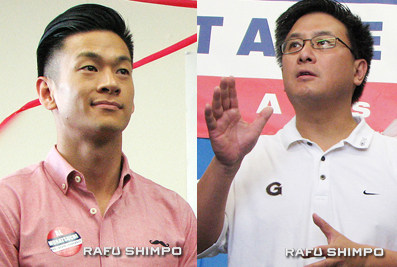 Since the district — which includes Gardena, Harbor City, Manhattan Beach, Redondo Beach, Hermosa Beach, Torrance and the Palos Verdes Peninsula — has more than 460,000 residents, many of whom are not registered to vote, Muratsuchi and his precinct walkers are targeting regular voters rather than going door to door.